Alternate Ideas for the Dress After "I Do"
Although having your wedding dress professionally cleaned and packed is the right choice for many, it may not be the right choice for everyone. An alternative may be reusing the wedding gown to redesign and create a new memory. One option may be cutting the train off or a section off the wedding dress and having it made into a christening gown for future children. 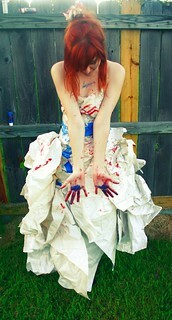 Other brides have donated their dress for many great causes that take in used wedding dress. A few of these causes include Mary Madeline Project, Brides Against Breast Cancer, Bridal Garden or Glass Slipper Project. A remarkable idea is trashing the dress, though it may not appeal to all brides. This entails ruining your dress on purpose with yourself, maybe your husband and a photographer. Some brides used paint, mud, salt water, or food and came out with some really fascinating photos in some neat locations. Other ideas include getting the dress altered for lingerie or bustier to get more use out of the garment. Using fabric from portions of the wedding dress and integrating into the cover or a page in a wedding album or surrounding framed photos is a fun way to “see” the wedding dress much more often. Last but not least, a bride may consider selling her wedding dress. There are two options when selling—direct sale or consignment. Consignment shops will sell the dress for you and once sold they will send you the proceedings minus their consignment fee. Direct sales can go through such sites as Craigslist, Ebay, preownedweddingdresses.com or Sellyourweddingdress.com. Contact Mark Pressed4Time to assist with alterations and cleaning your wedding dress before you make the decision about the traditional cleaning and storing of the dress or perhaps trying an alternate idea.